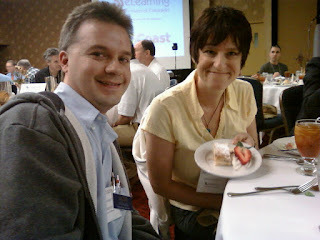 Vinnie, Jeff and I recently attended the eLCC conference. Here is a summary of the event and the sessions I attended. Lisa Marie Johnson and Karen Kaemmerling outlined how they deliver and structure faculty development courses and workshops. They are very willing to share anything that they have developed and in addition if anyone wants to actually take some of the courses they offer that is ok too! They frequently have attendees that come from outside of the CCCO. If you don’t already know, CCCO uses D2L for their course management system. They offer development resources on teaching strategies and using D2L. If you go to this link http://ccconline.org/Faculty/ then choose any of the categories on the right you can explore some of the resources, videos and handouts that are available. Several of the resources are brief (under 2 minute) videos. If you wish to register for the 2 week, self paced, D2L courses they offer, contact training@ccconline.org for specific instructions. The whole faculty “wiki” that they have developed is worth exploring and has several gems that can be utilized. I certainly appreciated the willingness that CCCO has to share content and materials. Pecha Kucha originated in Tokyo and means “chit-chat” in Japanese. Basically it is a presentation that is comprised of only 20 images for 20 seconds each. I have to admit this is the first time I’ve ever heard of this in particular. I have heard of the one minute lecture and that is great for a quick, concise concept explanation that potentially can be memorable. Are we not always striving to create content for our students that not only is engaging but memorable? I think we already know what doesn’t work. (aka: how quickly can we put our students to sleep?) But keep in mind this is just human nature and certainly not always easy to create a presentation or lecture that will have your students sitting on the edges of their seats with bright eyes. Dr. Medina suggests “you must do something emotionally relevant at each 10 minute mark to regain attention.” Keep that in mind when designing presentations. Barry’s keynote brought up a variety of points to ponder regarding education and choice. He referred to the book “Predictably Irrational” by Dan Ariely (which I am grabbing from the library today). Human nature always intrigues me and sets me into deep thought, so when Barry sent out the thought of “the power of free” and why do we (U.S.) make people pay for education? The funny thing is I have thought about this before. It certainly makes me angry that if I wanted to get a Ph.D I’d have to basically win the lottery or live in a cardboard box and eat pb&j for a long time. I digress; let’s get back on track with the keynote. The next idea to scratch our heads about is: “Why do we ask students to buy books (content)?” Why is it not already included inside the ‘course?’ Good question. Although Neil Postman’s book, “Amusing Ourselves to Death,” is focused on the transition of technology in the age of television and movies and how it affected our culture, it sort of parallels the digital age that we are currently experiencing. What is really thought provoking are the comparisons between Orwell (1984) vs. Huxley (Brave New World). Another book by Marshall McLuhan, “The Medium is the Message” was bought up. This book outlines how the vehicle of delivering the message may influence how the message is perceived. My interpretation of this concept with regards to higher education is that we always need to keep our educational goals and objectives in the forefront and not be clouded or even enchanted by the methods in which we deliver the content. As an instructional designer, we always say, don’t let the technology drive the content, the content should drive the technology! Lastly, Nicholas Carr and his book “What is the Internet doing to our Brains” and the 2008 article “Is Google making us Stupid” was mentioned to us. The author of these publications observes what the digital age is doing to our cognitive processes, ie. multitasking, critical thinking, and attention span. My first eLCC conference was an impressive experience. Every session attended over the three days offered takeaways that can be immediately applied to the RHCHP workplace. Kudos to the conference planning committee and all others that made this such a worthwhile experience. Now, on to the good stuff. Two of the most enjoyable experiences were a couple of hands-on sessions. The first was one facilitated by Kathy Keairns, a senior instructional designer at the University of Denver (is it DU or UD?) titled Leveraging Web 2.0 Tools to Support Teaching. Kathy emphasized a number of technologies that are free to use and mostly cloud-based. One of these was Picnik (www.picnik.com) for basic photo editing. Picnik is web-based, free and very easy to use. She cautioned that it can be buggy when using IE and works best with Firefox. Also demoed were Voki (tinyurl.com/6xrez4d) for creating animated avatars, and Viddler (viddler.com) for recording, downloading and uploading video creations. The session was highly interactive, resulting in a number of other recommended technologies such as Irfanview (www.irfanview.com) image viewer/editor, Xtranormal for movie making, and Voicethread (http://voicethread.com) for creating multimedia learning experiences. All are free with very shallow learning curves. The other hands-on was facilitated by Apple and provided experience with the iPod Touch. This was my first experience with the Touch and I was fascinated! Each participant was handed an iPod Touch preloaded with several education-based apps. Selected apps were then explored with ideas on their use in the classroom. One of the most enjoyable sessions was provided by Lisa Marie Johnson and Karen Kaemmerling of CCCOnline. They presented the session Open Content for Professional Development, examining the incredible number of courses available to faculty on effective learning strategies. It was continually emphasized that all trainings were available free of charge to anyone interested. This will be a valuable resource for RHCHP as we begin our move to Desire2Learn. Another session eye-opener that offered tremendous future potential was Jonathan Sherrill's talk on analytics and their use with D2L. Jonathan is a data analyst with CCCOnline and described several analytics tools available in D2L. He then took the presentation a step further by reviewing several 3rd party tools, all online and all free or low cost, that provide an even greater degree of granularity in the analysis of student course data. Absolutely fascinating and something I'm anxious to explore after our D2L implementation. 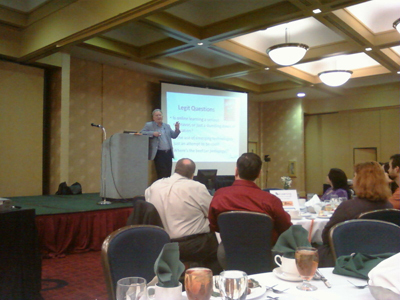 Barry Dahl's lunch keynote integrated clickers with the topic of technology adoption. The clickers were used to gather demographic data which was then compared with responses to several opinion questions. Barry weaved the results into an interesting comparison of attitudes towards learning technologies and social networks. 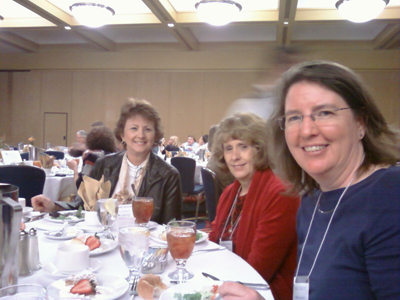 I had the pleasure of attending the 22nd annual elearning conference. This conference brings together faculty, instructional designers and business professionals to share their experiences about teaching and learning using technology. Below is a summary of some of the workshops I was able to attend. This session highlighted professional development courses offered by Colorado Community Colleges Online to new and continuing faculty. At Colorado Community Colleges Online faculty who wish to teach online must take a course for online teaching. Some of the courses offered are learning styles, managing discussions, Desire2Learn and many more. These resources are available at http://ccconline.org/faculty for anyone to view and use. There are software programs on the market that are efficient, but can be very expensive. This session focused on Web 2.0 tools that are free or inexpensive and that can save a lot of time. Some of the Web 2.0 tools presented were DropBox (Share files online), Snagit (Capture, edit, share and organize screenshots), DivShare (Upload videos, photos, documents, music that you can embed anywhere) and Jing (Take a picture or make a short video and share it on the web, email, Twitter or your blog). One of my favorites is Snagit.